Click to listen to episode (5:04). For Virginia Teachers (Relevant SOLs, etc.). Except as otherwise noted, all Web addresses mentioned were functional as of 11-23-18. From the Cumberland Gap to the Atlantic Ocean, this is Virginia Water Radio for the week of November 26, 2018. This week, the sound of sleet falling in Blacksburg, Va., in February 2018, opens our annual episode on winter preparedness. We start with some music about children being prepared for the wet and cold of winter. Here’s about 45 seconds of “New Boots,” by John McCutcheon, from the 1996 album “Four Seasons: Wintersongs,” on Rounder Records. In 2018, winter comes to Virginia on December 21 at 5:23 p.m. That’s the Eastern Standard time of the Winter Solstice in the Northern Hemisphere, when that hemisphere is at its maximum annual tilt away from the sun. To help you be prepared for winter’s cold temperatures, hazardous roads, power outages, and fire hazards, here are some tips from the Virginia Department of Emergency Management, the Federal Emergency Management Agency, and the U.S. Centers for Disease Control and Prevention. *Avoid traveling in winter-storm conditions if you can. If you must travel, get road conditions from the Virginia 511 telephone system, Web site, or mobile app. *Have an emergency kit for your vehicle, including jumper cables, water, non-perishable food, blankets, a flashlight, and other items. *Have a battery-powered or hand-cranked radio, especially one with a NOAA [National Oceanic and Atmospheric Administration] Weather Radio band. *Get fireplaces, wood stoves, and chimneys inspected and cleaned. *Install a smoke detector in every bedroom and on every floor level, test them monthly, and replace the batteries every six months. *Install a carbon monoxide detector in your home and check or replace the battery twice a year. *If you use space heaters, plug them into wall outlets, not into extension cords; keep heaters at least three feet from other objects; don’t leave heaters unattended; and check for cracked or damaged wires or plugs. *Generators, camp stoves, and charcoal-burning devices should be used outdoors only. *Use flashlights, not candles, during power outages. *Learn how to shut off water valves in case a pipe bursts. *Be careful of overexertion during snow shoveling. *And make a family emergency plan that includes a meeting place if your family can’t return home; an out-of-town emergency contact; and at least a three-day emergency supply of food, water, and medications. More information on preparing for severe winter weather, fires, and other emergencies is available online at the “Prepare and Recover” link of vaemergency.gov. Next time you hear real sleet or other winter-weather sounds, here’s hoping that you can stay warm, dry, and safe. Virginia Water Radio is produced by the Virginia Water Resources Research Center, part of Virginia Tech’s College of Natural Resources and Environment. For more Virginia water sounds, music, or information, visit us online at virginiawaterradio.org, or call the Water Center at (540) 231-5624. Thanks to Ben Cosgrove for his version of “Shenandoah” to open and close the show. In Blacksburg, I’m Alan Raflo, thanking you for listening, and wishing you health, wisdom, and good water. “New Boots,” from the 1996 album “Four Seasons: Wintersongs,” is copyright by John McCutcheon/Appalsongs and Si Kahn/Joe Hill Music, used with permission of Appalseed Productions. More information about John McCutcheon is available from his Web site, http://www.folkmusic.com/. Thanks to Mark Noonan of Appalseed Productions for his assistance. The sleet sound was recorded by Virginia Water Radio in Blacksburg, Va., on February 4, 2018. 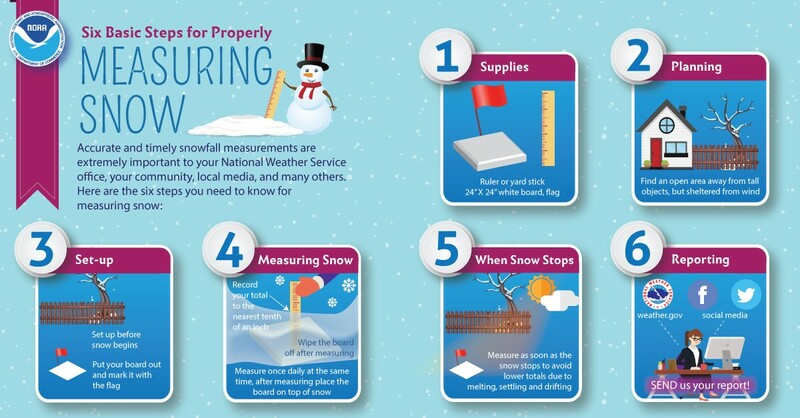 National Weather Service poster on how to measure snow accurately. Accessed online at https://www.weather.gov/safety/winter-snow, 11/26/18. Ice and snow on the Virginia Tech Duck Pond in Blacksburg, January 19, 2018. An early snow amidst fall leaf colors along Tuscarora Creek in Leesburg, Va., October 29, 2011. Winter Weather Preparedness – from the Virginia Department of Emergency Management (VDEM), “Winter Weather,” online at http://www.vaemergency.gov/prepare-recover/threat/prepare-recover/threats/winter-weather/, accessed 11/21/18. *During a winter storm, stay off the roads as much as possible and only drive when absolutely necessary. Always give snow plows the right of way. *Never use a generator, grill, camp stove, or device that burns fuels (gasoline, propane, natural gas, or charcoal) inside your home, garage, basement, crawlspace or any other partially enclosed area. *Snow shoveling is a known trigger for heart attacks. Always avoid overexertion when shoveling. *When severe weather occurs, plan to check on elderly or disabled neighbors and relatives. *If you must travel, know road conditions before you leave home. Visit 511Virginia.org or call 511 for road-condition updates. *Protect yourself from frostbite. Hands, feet and face are the most commonly affected areas so wear a hat, mittens (which are warmer than gloves) and cover your mouth with a scarf to reduce heat loss. *Keep dry. Change out of wet clothing frequently to prevent a loss of body heat. Wear several layers of loose-fitting, lightweight, warm clothing rather than one layer or heavy clothing. *Emergency kit: Download an emergency kit checklist online at www.vaemergency.gov. *Replace the batteries in your Carbon Monoxide detector annually. *To help with visibility, clean off your car entirely - including your trunk, roof, windows and headlights. 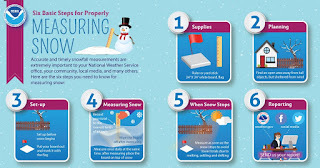 What To During a Winter Storm – From the National Weather Service, online at https://www.weather.gov/safety/winter-during; accessed 11/21/18. *Find Shelter: Try to stay dry and cover all exposed body parts. *When there is no shelter nearby: Build a lean-to, windbreak or snow cave for protection from the wind. Build a fire for heat and to attract attention. Place rocks around the fire to absorb and reflect heat. *Melt Snow for Drinking Water: Eating unmelted snow will lower your body temperature. *Exercise: From time to time, move arms, legs, fingers and toes vigorously to keep blood circulating and to keep warm. Avoid overexertion such as shoveling heavy snow, pushing a car or walking in deep snow if you are not in good health. The strain from the cold and the hard labor may cause a heart attack. Sweating could lead to a chill and hypothermia. *Slow down! Even if the roads just look wet they could still be slick. More than 6,000 fatalities occur on the roadways each year due to weather conditions. *Make sure your vehicle is completely clear of ice or snow before starting the trip. Flying snow from cars causes accidents. *Let someone know where you are going and what route you will take. If something happens, this person will know where to start a search. *If you are driving and begin to skid, remain calm, ease your foot off the gas and turn your wheels in the direction you want the front of the car to go. If you have an anti-lock braking system (ABS), apply steady pressure to the brake pedal. Never pump the brakes on an ABS equipped vehicle. *If you are having trouble seeing due to weather conditions, pull over to the side of the road and stop your car until visibility improves. Turn off your lights and use your parking break when stopped so that another car won't mistakenly follow your tail/brake lights and end up hitting you. *Stay in the vehicle! If you leave your vehicle, you will become disoriented quickly in wind-driven snow and cold. *Run the motor about 10 minutes each hour for heat. While running the motor, open the window a little for fresh air to avoid carbon monoxide poisoning. Clear snow from the exhaust pipe to avoid gas poisoning. *Be visible to rescuers. Turn on the dome light at night when running the engine. Tie a bright colored cloth, preferably red, to your antenna or door. After snow stops falling, raise the hood to indicate you need help. *When using heat from a fire place, wood stove, space heater, etc., use fire safeguards and properly ventilate. *If you have a gas furnace, make sure it is not blocked by a snowdrift as soon as it's safe to go out. If you have an upstairs gas furnace which vents out the roof, you may need to turn off the upstairs unit until the snow melts off your roof. *Close off unneeded rooms to avoid wasting heat. *Stuff towels or rags in cracks under doors. *Close blinds or curtains to keep in some heat. *Eat and drink. Food provides the body with energy for producing its own heat. Drinks lots of water and other non-caffeinated, non-alcoholic drinks to prevent dehydration. Cold air is very dry. *Wear layers of loose-fitting, lightweight, warm clothing. Remove layers to avoid overheating, perspiration and subsequent chill. On Fire Safety – from the Virginia Department of Emergency Management (VDEM), “Fires,” online at http://www.vaemergency.gov/prepare-recover/threat/fires/, accessed 11/21/18. *Install smoke alarms on every level of your residence, outside bedrooms, at the top of open stairways, or at the bottom of enclosed stairs and near the kitchen. *Test and clean smoke alarms once a month and replace batteries at least twice a year. Replace smoke alarms every 10 years. *Review escape routes with your family and practice escaping from each room. *Make sure windows are not nailed or painted shut. Make sure security gratings on windows have a fire safety opening feature so they can be easily opened from the inside. *Consider escape ladders if your residence has more than one level. *Make sure anti-burglary devices installed on windows can be easily opened from the inside. National Weather Service/Cleveland, Ohio, Forecast Office, “The Seasons, the Equinox, and the Solstices,” online at https://www.weather.gov/cle/seasons. TimeandDate.com, “Winter Solstice—Shortest Day of the Year,” online at https://www.timeanddate.com/calendar/winter-solstice.html. U.S. Centers for Disease Control and Prevention, “Carbon Monoxide Poisoning/Frequently Asked Questions,” online at https://www.cdc.gov/co/faqs.htm. U.S. Department of Homeland Security, “Build a Kit,” online at https://www.ready.gov/build-a-kit; and “Car Safety,” online at https://www.ready.gov/car. U.S. Federal Emergency Management Agency (FEMA)/U.S. Fire Administration, “Fire Prevention and Public Education/Outreach Materials” online at https://www.usfa.fema.gov/prevention/outreach/. Virginia Department of Emergency Management (VDEM), “Fires,” online at http://www.vaemergency.gov/prepare-recover/threat/fires/. VDEM, “Make an Car Emergency Kit,” 1 min./31 sec. video, online at https://www.youtube.com/watch?v=wPgvWgtiWHI. VDEM, “Prepare and Recover,” online at http://www.vaemergency.gov/prepare-recover/. This is the Commonwealth of Virginia’s central source of information on preparedness for all types of emergencies and disasters. VDEM, “Winter Weather,” online at http://www.vaemergency.gov/prepare-recover/threat/prepare-recover/threats/winter-weather/. Virginia Department of Transportation, “Virginia Traffic Information,” online at http://www.511virginia.org/. American Red Cross, “Winter Storm Safety,” online at https://www.redcross.org/get-help/how-to-prepare-for-emergencies/types-of-emergencies/winter-storm.html, or contact your local Red Cross chapter. Federal Emergency Management Agency, “Snowstorms and Extreme Cold,” online at http://www.ready.gov/winter-weather. John Muyskens et al., This map shows every inch of snow that fell on the lower 48 this year, Washington Post, 3/26/18. This article has an animated map showing snowfall accumulations during the winter of 2017-18, along with satellite videos of four nor’easter storms that hit the eastern United States in March 2018. National Weather Service, “Weather and Water Events Preparedness Calendar,” online at https://www.weather.gov/safety/events_calendar. This page lists events, such as “Winter Weather Awareness Week,” by state. National Oceanic and Atmospheric Administration (NOAA), “Weather Radio All Hazards” network, online at http://www.nws.noaa.gov/nwr/. U.S. Department of Energy, “Portable Heaters,” online at http://energy.gov/energysaver/articles/portable-heaters. All Water Radio episodes are listed by category at the Index link above (http://www.virginiawaterradio.org/p/index.html). See particularly the “Weather/Natural Disasters” subject category. Following are links to previous annual episodes on winter-weather preparedness. Episode 190, 12/2/13 (a repeat of Episode 139). Episode 242, 12/1/14, featuring “Cold World” by Kat Mills. Episode 292, 11/30/15, featuring “Winter is Coming” by The Steel Wheels. Episode 344, 11/28/16, featuring “Drive the Cold Winter Away” by Timothy Seaman. Episode 396, 11/27/17, featuring “Winter’s Fall” by No Strings Attached. Following are links to previous episodes on topics relevant to winter. Episode 258, 3/23/15 – on winter precipitation and water supplies. Episode 300, 1/25/16 – on words for snow. Episode 387, 9/25/17 – on frost. Episode 403, 1/15/18 – on freezing and ice, for kindergarten through 3rd grade. Episode 404, 1/22/18 – on ice on ponds and lakes, for 4th through 8th grade. Episode 406, 2/5/18 – on ice on rivers, for middle school. Episode 407, 2/12/18 – on snow chemistry and physics, for high school. This episode—the audio, extra information, or sources—may help with the following Virginia Standards of Learning (SOLs). 3.8 – Basic patterns and cycles in nature, including daily, seasonal, and lunar changes. 6.6 – properties of air and structure of Earth’s atmosphere; including weather topics. CE.6 – government at the national level. WG.2 – how selected physical and ecological processes shape the Earth’s surface, including climate, weather, and how humans influence their environment and are influenced by it. GOVT.7 – national government organization and powers. Episode 309 (3-28-16) – on temperature regulation in animals, for kindergarten through 12th grade. Episode 332 (9-12-16) – on dissolved gases, especially dissolved oxygen in aquatic habitats, for 5th grade. Episode 404 (1-22-18) – on ice on ponds and lakes, for 4th through 8th grade. Episode 406 (2-5-18) – on ice on rivers, for middle school.